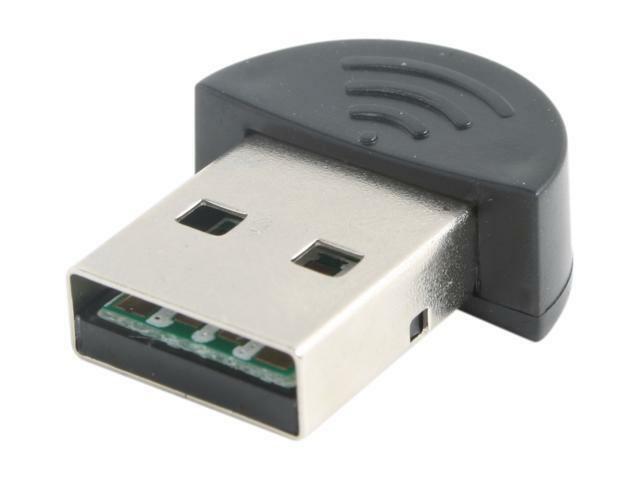 Other Thoughts: I heard a 'click' noise while inserting the dongle on my top USB port. After taking it out, I saw a little piece of silicon (some sort of a transistor) fell off the dongle. This device should not be DOA. We recommend completing our RMA form for a replacement device. Note that the end-user must pay for shipping the product to us. However, we will pay for shipping the replacement to you. Original packaging does not need to be used. Use any shipping medium you prefer. Instructions will be confirmed and sent to you shortly after you submit the form. RMA is covered in the United States and Canada. International RMA is unavailable. We do not do refunds. Refunds are done with the reseller you purchased from. Thank you for purchasing on of our products, and for leaving us your valuable feedback. Cons: For the money you really set what ya pay for. Haven't even had a week and the cheap plastic casing split in two. The connection with a bluetooth headset was absolutly horrid. Other Thoughts: Needless to say I would NEVER buy a SYBA product AGAIN. We apologize for any issues that you are having. As you know we are more than happy to provide our customers with a hassle free exchange when a product is defective. Thank you for purchasing one of our products, and for leaving us your valuable feedback. We value all positive and negative feedback. Cons: The device didn't function after driver installation. The LED would illuminate, but it did not pick up any BT devices. Furthermore my OS (Win 7 Pro 64 bit) wouldn't recognize it after reboot. I/O Crest (www.iocrest.com) is the site that is listed on the package. It specifically read in the requirements that this device only worked with Win XP, Vista, and 7. Other Thoughts: I noticed that this product worked well for some buyers and not at all for others. Its possible a software or hardware issue on our part (if it doesn't work), but unlikely. I'd go so far as to say that this purchase is a gamble. If you feel luck then roll. Pros: Sound quality is good and crisp. It was very easy to install and is very small so its not annoying. Cons: sometimes it sounds like you are hearing a record but it corrects itself after a while. Pros: None anymore. These used to be cheaper than the higher quality ones but now they are so close in price there is no reason to purchase this cheap poor performing device. Cons: For context of my review, I am familiar with the background technology that runs these devices. This adapter has very low transmit power. I measured it compared to 3 other adapters and it's less than half with some test equipment. Low transmit power is not a problem if you're going to just be transferring files back and fourth to your phone while your computer is on your desk. It will make no difference really do to the low technical requirements of such an activity. *A2DP (Wireless Stereo Sound) - high quality, standard, or even low. *To use this adapter with a bluetooth device that is ~10 feet away or greater. You will see very poor performance from this device. Other Thoughts: music you will have very poor performance (choppiness, stuttering, unlistenable) on high quality audio (needs lot of bits) and mediocre perf on low quality audio (more of the same but reduced severity. This device has such low transmit power that transmitting data to a device that is 10 feet away even on the lowest quality setting is easily interrupted by standing between the two, or placing an office chair, or pretty much anything in their line of sight. Terrible performance. Also, there are no Win7 driver support except the lackluster Win7 built-in driver - which is *extremely* feature limited. The Toshiba bluetooth driver works well but you wouldn't know that from anything here and again performance is still poor because the device hardware is mediocre. Spare yourself. Pick up a higher quality bluetooth dongle for a couple bucks more and save hours of frustration and guessing. Avoid this style/brand in the future. We are sorry to hear that this device did not meet your expectations. We engineer all of our products with the needs of our users in mind, and this Adapter is no exception. Please contact us for an updated driver that may resolve your above listed issues. Or worst case scenario, provide you with a replacement. Thank you for purchasing one of our products. We value all positive and negative feedback. Our business depends on your satisfaction. Pros: I have two of these, they work fine for streaming audio from desktop/laptop to a Jabra bluetooth headset. Transfers files to and from Samsung Galaxy S quickly. No problems during setup, Windows 7 found the device and installed drivers without problem. Cons: Range isn't great but I believe that's more a bluetooth issue rather than a device issue. Other Thoughts: My guess is that a lot of people that have trouble with devices like this are actually experiencing computer or software/device driver issues rather than device issues. Know what you're getting, know how to use it and if it doesn't work learn how to fix it. ° Plug it in and let the drivers install automatically. ° Open MotionJoy and select bluetooth pair. ° Voila -> Ps3 wireless controller on windows ! Please contact us asap. It is our intention to make high quality and easy to use products. It is our intention to make our customers smile when they choose our products. Without giving us too much information, it is really difficult for us to find a possible solution to the problem. A possible problem might be simply pairing the device. After installing our Bluetooth dongle, you need to pair the mouse with our dongle in order to get the Bluetooth to work. Bluetooth will not work the same as USB wireless mouse. We are more than willing to provide all of our customers with prompt exchanges whenever a product becomes defective.